I could have responded to this in several ways… I could have rebuked him: How dare he question our faith and his trust in God! Or I could have ignored him: If I don’t answer this, maybe he’ll forget about it and I can avoid a difficult question! In reality, I was both pleased that he was willing to ask, yet scared that my response would be insufficient! Why do we feel the need to know it all? Why are we afraid to declare that we have questions about faith and wonder how God works in this world? 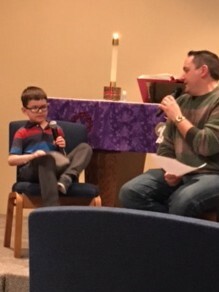 This past week my son and husband sat in front of the congregation during a Lenten service to share their story. They asked each other questions, like “Why do you believe in God” and “Why is it important to come to church.” My son admitted he was a little nervous (I would have been absolutely terrified). But he was so brave, and so honest! Our only advice to him was to speak from his heart. My son shared that sometimes it is hard to believe in God. He said that your mind will question the truth and try to convince you that God isn’t real. But his heart knows God is there. He admitted it is hard to understand what Pastor says in church – which got a laugh! But he likes to come to church to see his friends and go to Sunday school and help in different ways. He concluded the Q&A by saying that God loves us, God cares for us and God is real. So simply yet beautifully stated! As an adult, it is harder to admit when we have questions; or to declare that we do not know the answer. In this world we pride ourselves on being the best, brightest and most important. But in faith we are all children of God, working to find the divine within and amongst the human. When we are honest with each other – when we simply speak from the heart and be open to the response from those around us – it allows us to be better community. This means we must both be willing to ask the questions – but also be willing to listen to the questions of those around us without judging. If we are real with one another, we will learn that we all ask similar questions about faith, yearn for the same connection with God, and require support and guidance from community in various ways throughout life. With a 7-year-old setting the example, share your faith – including your questions; be honest within community. Then let God work! Categories: Parenting | Tags: children, community, faith, God, honesty, love, parenting, questions, trust | Permalink.